This Walrus was my first Solo backpacker hiking tent for a first dive trip of many since, this baby has been through a lot, seen a lot, weathered a lot. Been through ice, pouring cats and dogs, 5degree out there, Florida humidity camping with my very overweight friend, her daughter, and my dog. We took this fancy couple who bought a 2-room state of the art room tents and it got so hot at night they slept outside bugs-eaten, and unhappy. All 4 of us did not experience heat, nor sweat, we slept sound, comfortably, we were cool and refreshed from a well rested sleep from the night before. It was surreal. This is by far the best tent I have ever slept in. I have been trying to get the tent treated and get it updated, waterproof, and all and just cannot seem to find anywhere to be able to do anything for it. Pretty soon it will be time for me to replace my baby and I cannot part with anything less than the same, I don't know what to do? I was looking for a light comfortable solo tent for 3 season backpacking. I'm a large fellow (6'250lbs) which is why I chose the ZIOD 1.5 as opposed to the 1.0. Solo tents that taper at the ends might advertise a good length and width, but the reality is I find them to narrow and confining. The ZIOD 1.5 gives me plenty of room at both ends. I find this style superior to end entry. It makes for easier sleeping gear setup and great for venting on hot humid nights, plus its just easier to get in and out of. The fact that there are two (one on each side) there is plenty of room for by backpack and other misc gear. I try to maximize weight to usefulness with every peice of gear I take. At 4lbs pack weight, its my tent of choice. I would desribe this tent as "easy to set up". Just make sure that te rain fly is fastened tight to the ends. This will prevent the canopy frm sagging, giving you a feeling of more headroom. I purchased this tent recently to use on those backpacking trips where I was going solo and did not need my Moss tent (bombproof but heavy). I looked at several solo tents on the market and decided on the zoid 1.5 based on the large vestibule space and its ability to accomodate my 6'2" frame with some space left over inside the tent. Several of the other solo tents on the market advertise a large tent length, but often that length is so narrow toward the head or feet that you would need to be a spelunker not to be claustriphobic. This tent, however, has plenty of room around the head and shoulders. I've used this tent in the Sierras and it has withstood several hours of rain and hail with no leaks (I did seal the bottom seam before I went out, it didn't look trustworthy). This tent has a door on either side (as well as a vestibule) which has turned into a very handy feature. I put my pack on one-side, and exit on the other, with no climbing over gear. It goes up quickly and I suggest guying the bottom part of the tent firmly if you expect rain, it will help avoid puddling on the fly. Another nice feature is the light coloring of the tent which allows a lot of light in. 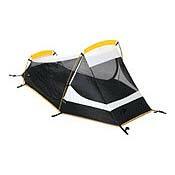 If you ever think you will be doing anything other than just sleeping in a solo, this is the tent to get. There is actually room to move around, without a lot of weight. The Zoid 1.5 was purchased based on Walrus' reputation as well as the need for a light weight 3-season solo type tent that afforded more room than the traditional solo tent. Although I have used it only sparingly so far, it has exceeded my expectations. On the 4th of July it was used on an overnight stay on the Alabama River below Selma, Alabama and performed flawless. Heat and humidity was high and it rained for 5 hours that night. No leaks and the ventilation was excellent. One would be hard pressed to find a shelter that would top this tent. I particularly like the side doors and vestbules on the tent. I highly recommend it to anyone looking for a light weight dependable shelter. A little "surfing" on the WEB and it can be bought at a discount. I hope Walrus will take this design and manufacture a 3+ season shelter. It's a winner!